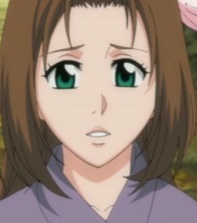 Mayu is a Soul that lived in a Forest in Soul Society who lost her family to an attack by a Hollow. Mayu is a woman of youthful appearance with long, straight, brown hair and large green eyes. The top of her hair is kept in a quiff and to the left side of her head, she wears a pink flower. She also wears a simple, purple kimono over her slender body.